The S.A. provide together our business partner, to supply fully automated plant from puff machines to pallet. 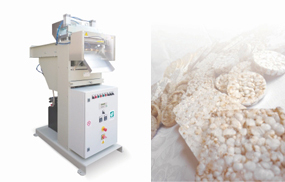 Specially designed for the production of cakes made up of rice, maize spelt, wheat, kamut cereal mix and gelatinized pellet. Our Puff Machines RP Series are solidly built and highly functional. The fully hydraulic pressing plant allows to manufacture cakes made of all different types of cereal including the ones difficult to be processed just with few simple adjustments. A simple adjustment of pressure and cooking time will enable to obtain in few seconds the wished cakes. Our RP Machines are completely controlled by PLC and their operation fully customizable.